Stringerless foam blank, Volan glass, marbled gel coat, pencil faux stringer (deck only). Deck: Clear , pencil faux stringer, with 1 inch green marbled rail overlap. Collected by Ralph Riddell , circa 2001. The tail rail overlap cuts are crude. 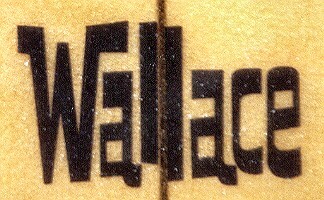 The board is in solid condition, like other Pop-out examples, possibly due to initial production process. These Popouts appeared in 1970. Commonly used stringerless glassed blanks with minimal shaping to reduce prices by about 40%. Often full pigment, sometimes marbled. 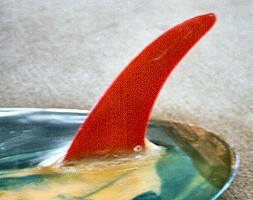 Fins usually have no rovings, being mitred into the blank. They were manufactured by Shane Surfboards ('Standard'), Wallace Surfboards ('Junior'), Farrelly Surfboards, and Merrin Surfboards, Queensland. 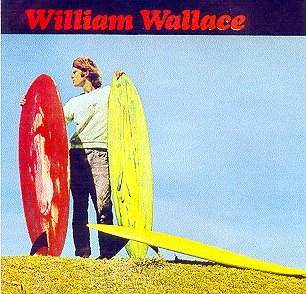 #115 1967 Wallace, V bottom 7 ft 8"
Surfing World Volume 14 No. 5 1970 See below. Accompanying text, reformatted for legability, below. 4. Camel or S-deck, a common feature of the period. high quality, low weight model at the low cost of $59. Length is 5' to 5' 3'' and the board has a round tail and round nose design. With a total weight of eight pound, it is ideal for all junior and lightweight surfers. or can be bought at any SURF'N'GEAR SHOP.